Why and how can I sign my Java applet? When running as an applet, Java is restricted by what it can do. For instance, it can not open files on your local machine or send content to the printer. To get around this, you need to ‘sign’ your applet. When you sign an applet, it gets privileges automatically. 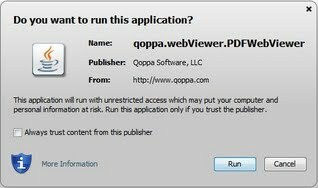 When a signed applet is loaded for the first time, user will be asked for permission to run the application (as with any application installer). To see a live demo of a signed applet, check our basic applet sample to view and annotate PDF documents. Users should choose to “Always trust content from this publisher” (by checking the check box on this dialog) so this dialog does not show next time they access the applet. New applets requirements with Java 7 Update 51!